It finally happened! 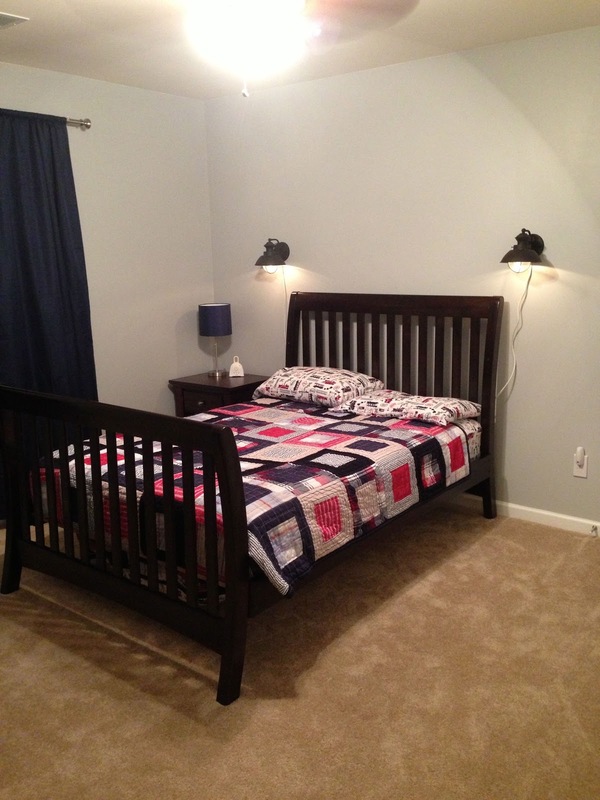 After seemingly months of planning and less than 10 hours of execution, Chase's new big boy room is finished! What a whirlwind day we had! Be sure to make it to the end of this post to see the video of our boy seeing his room for the first time. Precious, I tell you!!! The kids left around 10:30 AM to have a day o' fun with the grandparents. From the museum to Red Robin for lunch to a friend's birthday party, they stayed busy and had a blast! 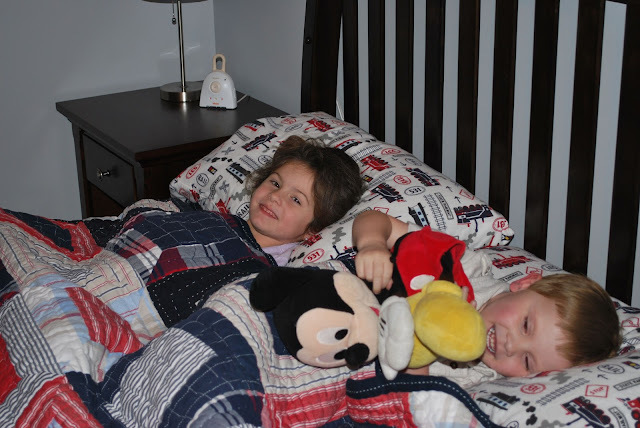 Then they were off to my mom's house for a few more hours of fun while mommy and daddy worked like crazy! We picked them up at 8PM so that left us with just under 10 hours to complete this magnificent room transformation. Crazy, right? Anywho, let's take a look at the "before" pics. I only took two because that's all that was needed to see the extent of his entire room. Sad, I know. 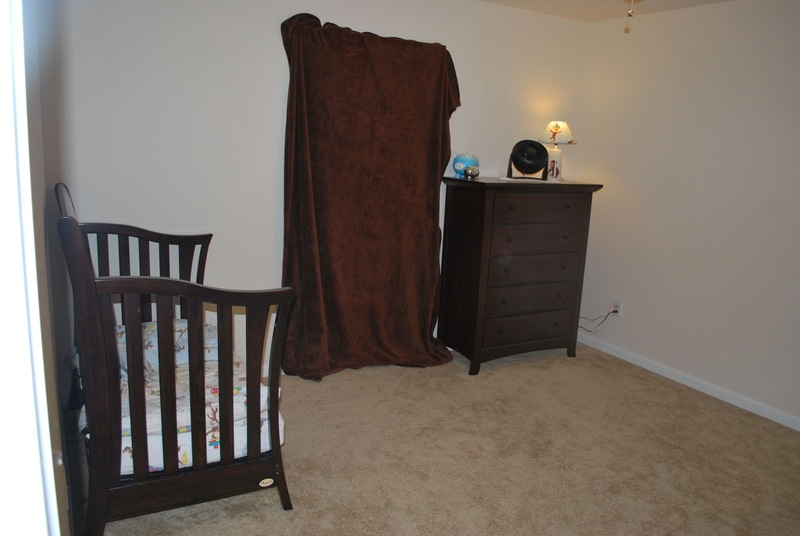 Toddler bed in one corner, dresser in another, and a lame, brown blanket covering the window, stuffed into the valence of the blinds. So embarrassing. 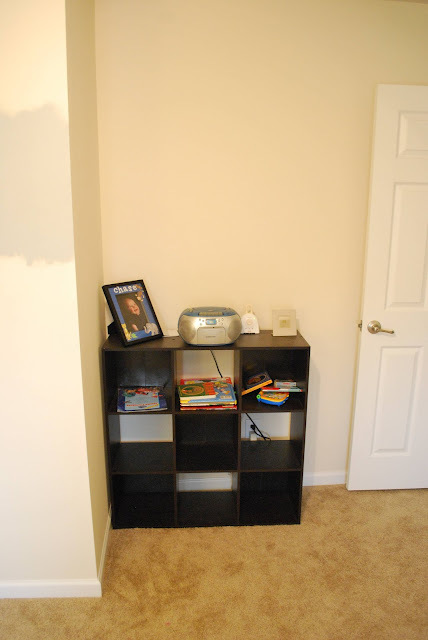 Another corner housed an unused cubical storage thingy along with a few books. You can see his wall color here was the standard flat creamy color painted throughout the house, and also the swatch of the new paint color sample I painted to the left of the cubical thing. So happy I fell in love with the one and only sample I selected! 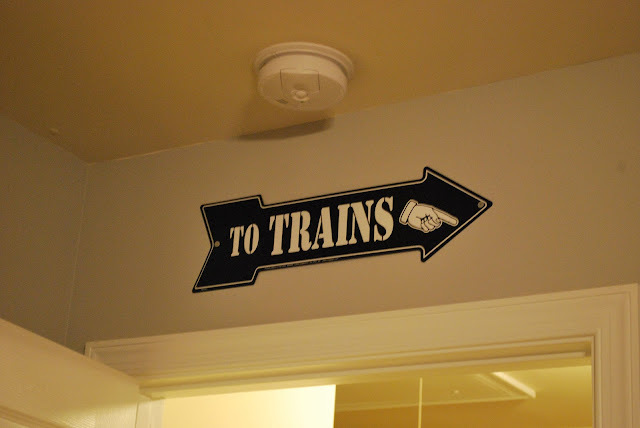 I knew "Secret Passage" by Olympic would be the perfect touch for this train-themed room. 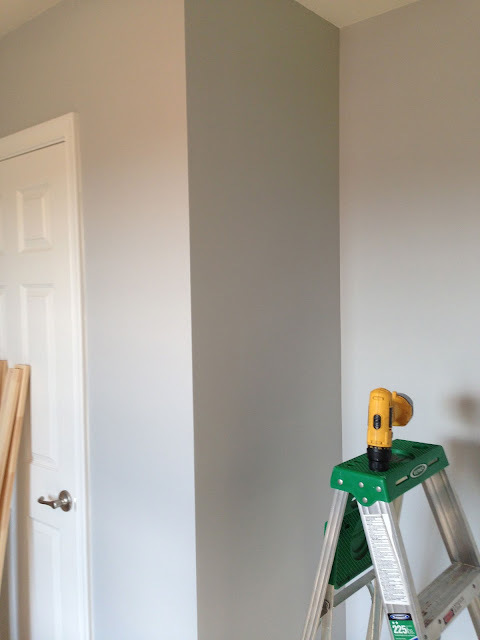 We of course started by removing the furniture, taping the walls for the paint and then started painting. 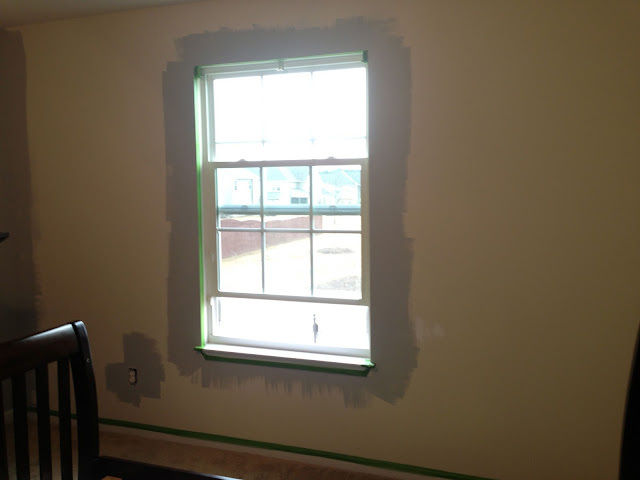 We assumed our typical positions: me with the roller for the walls and hubs with the paintbrush for the trim. It's been learned during past painting experiences that I don't have the patience to deal with trim paint without schlepping it all over the ceiling, floor and everywhere else it isn't supposed to be. Unfortunately the brand new roller I busted open was literally covered with fuzz and even after trying to get rid of it before I started painting, I still ended up with big chunks of fuzzies on my wall, which made me quite upset. 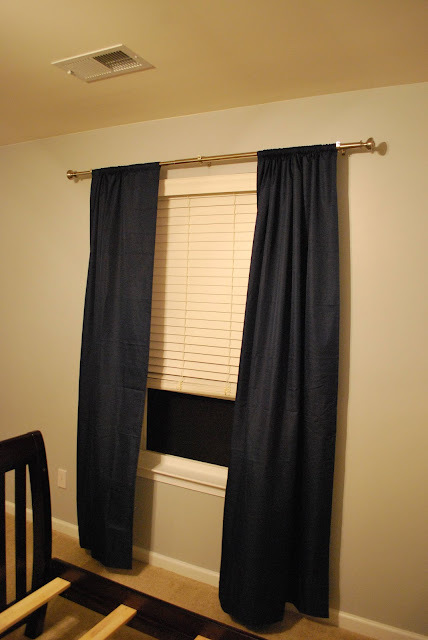 We were 10 seconds from an unexpected trip to Lowe's when hubs realized he had some other ones in the garage, and they worked perfectly! Whew! I was super worried because I didn't add unscheduled trips to Lowe's for additional supplies into my timeline. I had been planning to start at 8AM until some childcare issues popped up, so the 10:30AM start time was already putting some serious stress on me. So thankful for hubs and his spare fuzz-free rollers! The painting went seamlessly from then on. See how gorgeous this new color looks?? I love the contrast with the white doors and trim. 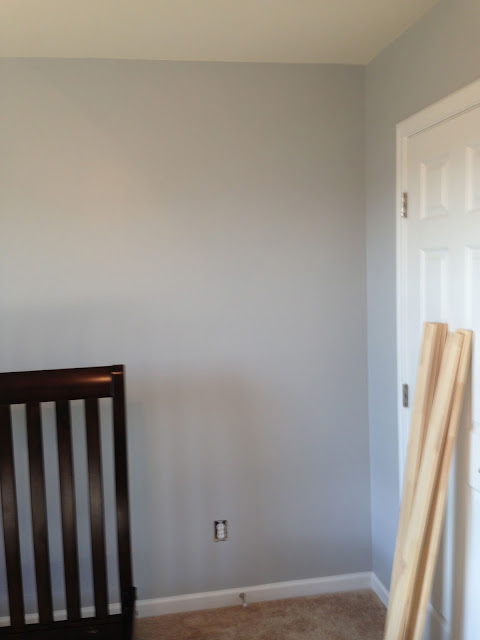 The color card sample from Lowe's looked absolutely and totally and completely GRAY but once up on the walls, there is definitely a blueish hue, which I totally love. Everything moved along nicely that is, until we ran out of paint with just one wall remaining. Grrrrr! So much for avoiding unplanned trips to Lowe's! I had to send hubs out for more paint while I worked on disassembling Chase's toddler bed and cleaned and prepped it to convert into the full size. I want to take a moment to share here that, in case you didn't put two and two together, hubs and I had basically an entire day without kids. This is quite a rarity!! 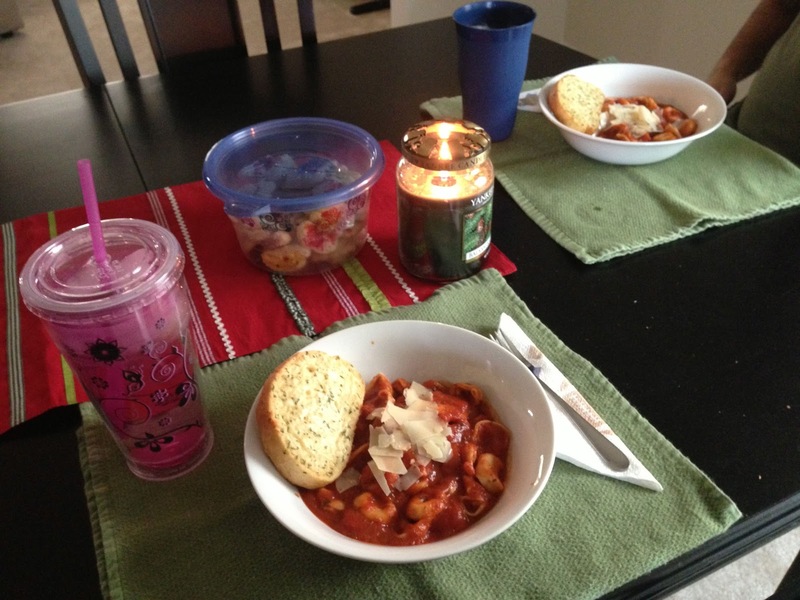 So we took advantage of it with a lovely lunch for two, complete with yummy cheese tortellini, candlelight and some delicious cookies for dessert that the kids and I had made the night before. It was wonderful to dine at the table instead of the kitchen island like we usually do as a family. Something about sitting at a table just feels more "grown up." Regardless, it was quite lovely to interrupt our over-scheduled day with a quiet lunch for two. Following lunch, we were able to make some serious progress in Chase's room. While hubs finished up painting the last wall and working on the new lighting, I was able to start putting together the other areas in the room since the paint was finished and dry. I returned his cubical storage thingy to the same corner, this time with added fabric bins for toys and an organized book collection of Chase's favorites. 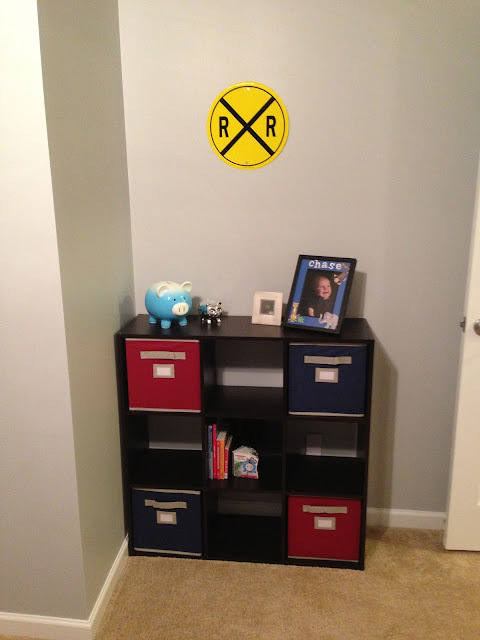 A railroad crossing sign helped tie in the little bit of yellow I wanted to include in the room. The wall across from his bed would be the new home for his dresser, complete with the train artwork I made specifically for his room. 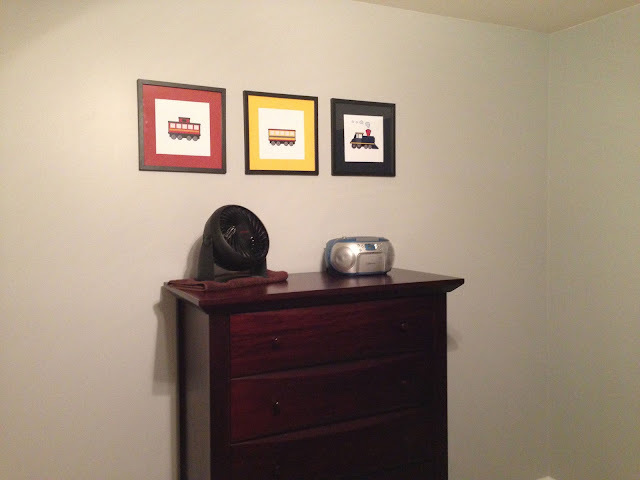 I purchased 12x12 frames from Hobby Lobby, sheets of scrap paper to create a matte in red, yellow and navy, and created individual train pics in Photoshop that I colored to match the mattes. The train itself is rather juvenile but I figure it's perfect for a 3-year-old's room, and can easily be changed out as he gets older and his interests change. I love how simple it is and how it stands out beautifully against the new wall color. Sorry for the bad lighting here (it was dark outside by this time so I had no light to work with), but we put a little "To Trains" sign up over his door. It worked out perfectly that this sign is actually pointing directly to the train art in the previous pic! Haha! 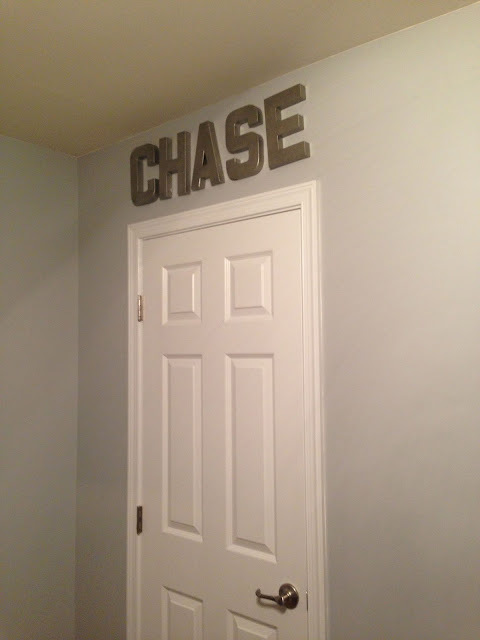 The last wall project was Chase's name above his closet door. I purchased cardboard letters from Hobby Lobby and spray painted them with a brushed nickel paint. I love the way they turned out! They don't look like they cost about $1 per letter! The final piece to finish up was his new bed! 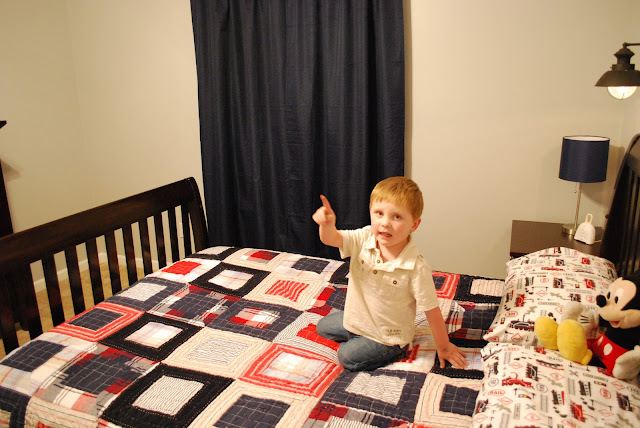 I was beyond excited to bust out my Pottery Barn Kids purchase of his flannel train sheets and adorable patchwork quilt! Once the bed was made, the room totally came together and I was completely in love!!! Since we found with LO's Munire convertible furniture that the full size bed sits so high off the floor, we opted to just put the mattress on for now to keep the height a bit more reasonable for a 3-year-old, but we'll probably end up adding the box spring next spring before the baby comes since I'm pretty sure I don't want a full-size box spring as part of my baby's nursery decor. We ran out of time before hubs could cover the wires from the sconces so he's finishing that up today. Honestly, to know that in less than 10 hours we were able to get everything done except this one thing was truly amazing! Hubs left to pick up the kids while I took a much-needed hot shower. I was achy all over from several hours of hard labor and my preggo self was feeling the pain! 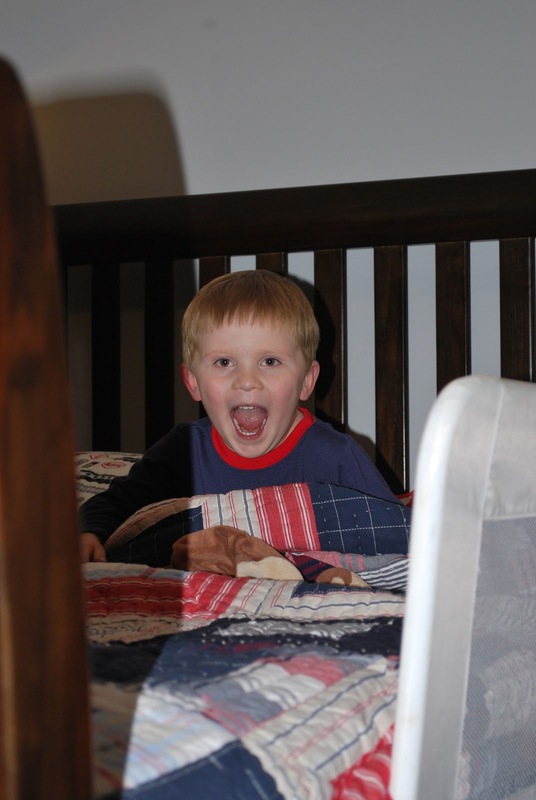 But the excitement of Chase seeing his new room for the first time made it all worth it and then some! When hubs returned with the kids, I positioned myself in Chase's room with my iPhone to record video and our camera to take pics. I wanted to document this moment via all sorts of media! LOL! The first pic of Chase entering the room was blurry with horrible lighting, but I'm posting it anyway because I think his little blurry face says it all! LOVE!!! 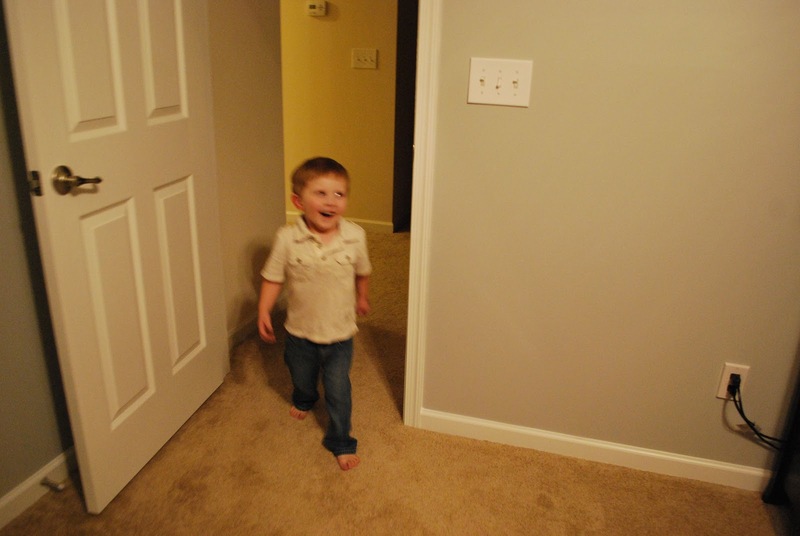 He was all smiles as he walked into his new room and headed straight for his new big bed. 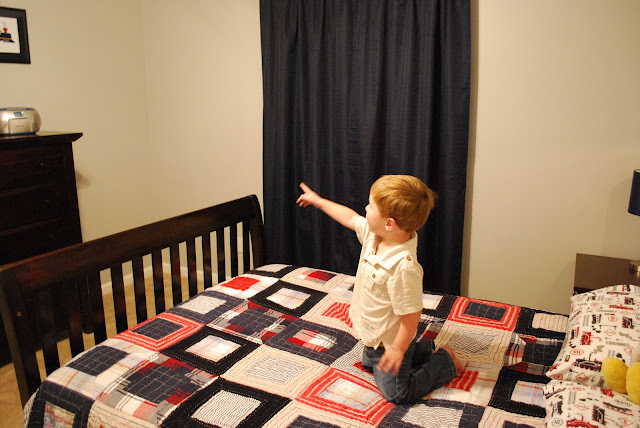 Then he started pointing out all the different things on the walls. It was SO CUTE!!! 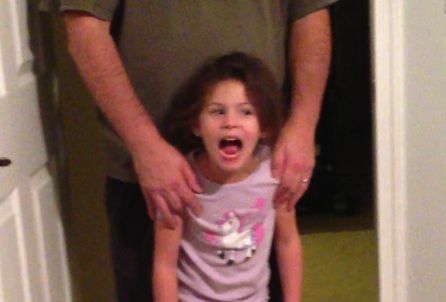 We let LO come in a few minutes later and here's her reaction (this was a still shot I made from the video of her walking into the room, hence the fuzzy, poor quality). She loved it, too!! It didn't take too long for these two to snuggle up in this new bed. Chase was so thrilled with his new room! I couldn't have been happier with his reaction or with how beautifully the room turned out. It looked exactly like the vision in my head and I am so happy it's finished and that he loves it so much!!! 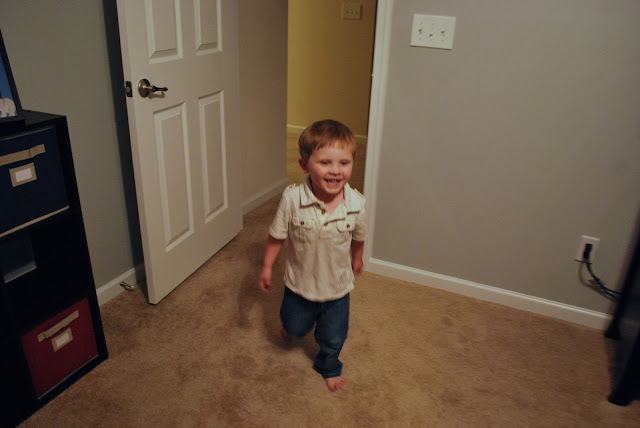 And now, without any further ado, please check out the video below of Chase seeing his new room for the very first time. Pardon all of the pics I was taking while recording the video. ;) Love! Love!! Love!!! Very cool. SO nice! Can I borrow you guys to come over and help me with my boys' room?